Updated on July 12, 2018, Apple's 2018 15-inch MacBook Pro with Touch Bar laptops are the fastest MacBook devices in the entire lineup. 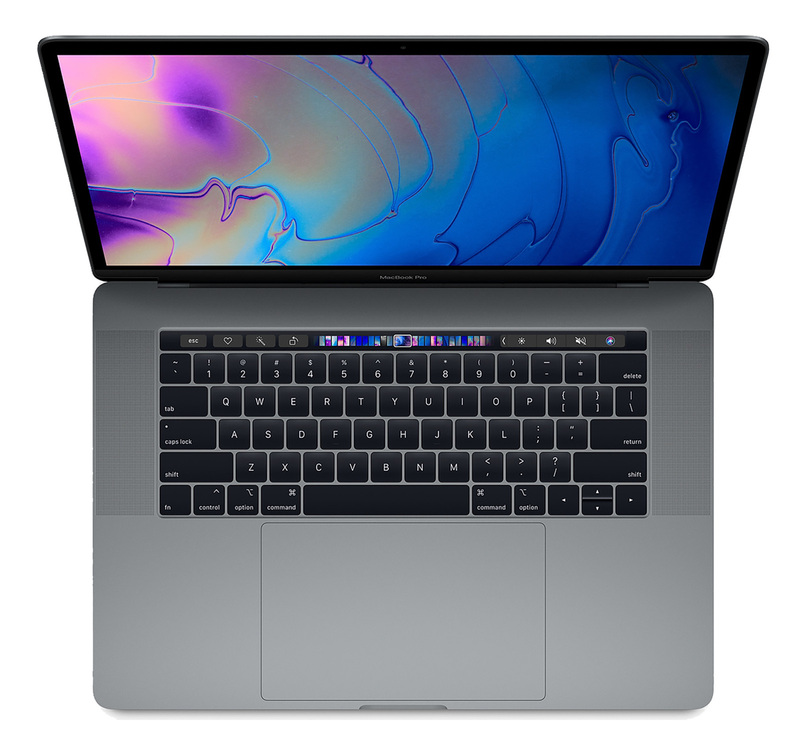 Packing 8th-generation Intel Core processors with up to six cores, the standard 15-inch MacBook Pro is equipped with a 2.2GHz Core i7, but CTO models can be configured with a Core i9 processor clocked at 2.9GHz with a Turbo Boost speed of 4.8GHz. The graphical power has also been boosted to include Intel UHD Graphics 630 integrated GPUs, as well as Radeon Pro 555X and Radeon Pro 560X discrete GPUs. All 15-inch models have 16 gigabytes of DDR4 memory, and for the first time in a MacBook, can be configured with up to 32 gigabytes of memory. Storage capacity options have also been improved, with models starting with 256 or 512-gigabyte SSDs, but these can be increased up to 4 terabytes in capacity. The 15.4-inch wide color (P3) display gains True Tone technology from the iPad, allowing the screen to alter its colors on the fly so images appear the same under different environment lighting. While appearing the same as before, the keyboard has also received an upgrade of a new membrane that quietens typing while also helping to reduce the amount of debris that can slip in and jam the mechanism. Just as with earlier models, such as the Mid 2017 15-inch MacBook Pro with Touch Bar, it includes the Touch Bar with integrated Touch ID sensor, four Thunderbolt 3 ports with support for charging, DisplayPort, and USB 3.1 Gen 2 connections, and the choice of either Silver or Space Gray finishes. Looking at the outside of the computer, it is very easy to think that the new 15-inch MacBook Pro with Core i7 processor is unchanged from last year's model. However, there are a surprising amount of improvements beyond just a new and powerful processor that Apple users have been looking for. 15-inch 2018 MacBook Pro compared - which upgrades are worth it?